The health uses of flax date back to ancient Egypt and the Roman Empire. According to Purdue University, retailers sell flax in three different forms. 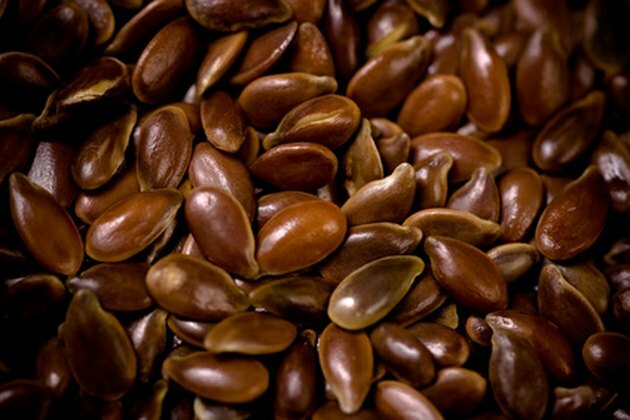 Whole flaxseeds sell in bulk and flaxseed oil, also known as linseed oil, is available in capsules or bottles. Flax meal is a third form of flax, which appears to hold the most beneficial properties. Flax meal is actually ground flaxseeds. Whole flaxseeds are high in omega-3 fatty acids, which have cholesterol-lowering properties. Flaxseeds also contain dietary fiber that helps relieve constipation. According to North Dakota State University, the best way to yield the benefits of whole flaxseeds is to grind them into a fine powder. Better known as flax meal, the ground flaxseeds keep for several months in the refrigerator or freezer, inside an airtight, opaque container. The plant that produces the seeds for flax meal is an upright grower that reaches mature heights between 12 and 36 inches. The flax flower contains five blue petals and an attached boll containing an average of six to eight seeds, according to Purdue University. After a 30- to 40-day maturation period, flaxseeds are ready for harvest. Mature flax contains brown bolls and yellow stems. Threshing releases the brown or gold flaxseeds after ripening. The sooner flaxseed grinding occurs after harvest, the more bountiful the nutritional contents of the flax meal. The flaxseeds used to make flax meal contain chemical compounds that mimic the natural hormone estrogen. These compounds, referred to as lignans, may have the potential to protect the human body against certain cancers, according to the University of Maryland Medical Center. Research is ongoing as to whether the lignans in flax are capable of shrinking tumors and reducing cancer cells as well as preventing breast, colon and skin cancers altogether. Finely ground flax meal easily incorporates into the daily diet. North Dakota State University explains that ¼ cup of flax meal per day is safe and effective. Stirring the ground flaxseeds into fruit juice or sprinkling the flax meal on cereal is just a few ways of adding flax to the diet. Flax meal also has a place in baking as a fat and flour substitute. In recipes that call for flour, flax meal can replace up to one-third of the flour. In recipes that require the addition of fat, substitute ½ cup of flax meal for every 2 to 3 tbsp. of fat.